The United States of America is home to some of the finest beaches anywhere in the world. Looking out onto the Pacific Ocean, Atlantic Ocean, and Gulf of Mexico, the beaches of America come in all shapes, sizes, and forms. Some feature picture perfect, postcard-style stretches of shiny white sands and glimmering turquoise waters, while others are completely different, with golden sands and extensive mangroves all around. Florida’s beaches all have their own unique charms and features, but the one thing that unites them all is the warm weather conditions; the Sunshine State enjoys some of the best weather in all of North America, with lots of sunshine and high temperatures to be enjoyed along the many miles of Floridian coastline. Located in Hernando County on Florida's Nature Coast, Spring Hill is a scenic little community in the Tampa-St. Petersburg-Clearwater metropolitan area. It's a fast growing area and is currently home to around 100,000 people, attracting thousands of visitors each year due to its proximity to some of Florida's best beaches and most special natural areas like Weeki Wachee Springs. Many Florida beachgoers tend to visit the Tampa Bay area, but some of the main beaches and cities can get quite crowded and noisy. Spring Hill offers something different; it's still close by to all those major beaches, but it also has its own local natural attractions to enjoy and offers a uniquely peaceful, tranquil atmosphere for travelers who want to steer clear of the crowds. Florida is one of the best beach states in America and Spring Hill is a great place to start your beach adventures in the Sunshine State. This community is conveniently located to the north of the Tampa Bay area, offering a quiet environment and a good range of calm, beautiful beaches, while also being just a short drive away from major beach cities like Clearwater and St Petersburg. In short, it’s a prime spot for a beach vacation, and if you want to learn more about the best beaches in Spring Hill, read through the guide below. Located in Tarpon Springs, just a short drive south of Spring Hill, Sunset Beach is one of the best rated beaches in the area. Locals and tourists alike have fallen in love with this beach for generations and, as the name suggests, it's one of the prettiest beaches in Florida to sit and watch the sunset. It's also one of the closest major beaches to Spring Hill, so it's a good option for people staying in the area. Amenities at this beach include picnic areas, restrooms, free parking, and volleyball courts. Fun activities to enjoy here include water sports like kiteboarding, as well as swimming, snorkeling, and sunbathing. Most of the best beaches in the Spring Hill area are located to the south, but if you’d like to head a little further north up the coastline, don’t miss out on Fort Island Gulf Beach. This is a beautiful little spot with clear blue waters and silky smooth sands. One of the highlights of this beach is its huge fishing pier, which is actually separated from the main beach, so you have to walk along a boardwalk through some marshy vegetation to get to it. The pier and sandy spots at this beach offer some super views and photo opportunities, and the beach is fitted out with some good, simple amenities like a boat ramp, picnic areas, and clean restrooms. Clearwater Beach is a bit of a drive south from Spring Hill, but it's definitely worth the time it takes to get there. This is one of the most famous and highly rated beaches not just in Florida, but in all the world. The sand here is made from 99% quartz, making it exceptionally white and soft and earning Clearwater lots of awards and rave reviews over the years. 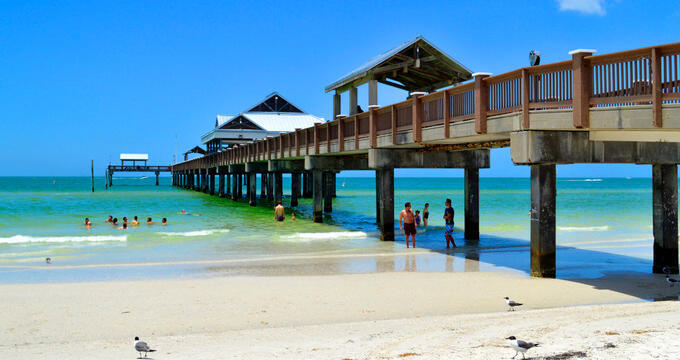 Some people come to Spring Hill and the Tampa Bay area just to visit Clearwater; that's how beautiful this beach is. It's the perfect spot to stretch out on the sand and feel completely at peace with the world, and there's a nice romantic vibe that couples are sure to appreciate as well. Not far from Clearwater Beach is Caladesi Island State Park, another of the Tampa Bay area's best-rated beaches. This little island is easy to access and home to all kinds of wildlife, making it a super spot for nature lovers. There are various scenic trails to be followed around Caladesi Island State Park and all kinds of birds and other examples of fauna and flora to be spotted and admired. Be sure to bring a camera along as you never know what you might find at this Spring Hill beach and remember to stay until the evening to watch the sun go down. If you're looking for a family-friendly beach that's not too far from Spring Hill, Robert K Rees Memorial Park could be the right place for you. Situated in New Port Richey, a relatively short drive away from Spring Hill, this is a charming little waterfront park with a lot to offer for visitors of all ages, especially youngsters. There are lots of picnic tables and an extensive play area for the kids, as well as soft sands and lovely views all around. Since Robert K Rees Memorial Park is situated a little ways north of the main touristic beaches like Caladesi Island and Clearwater, it never gets too busy, so it's a good compromise for people who prefer their beaches to be peaceful.